BOOKTRYST: Hey, Rare Book Guy! Will Rogers (1879-1935). "I never met a man I didn't like." The Rare Book Guy is the Will Rogers of catalogers: With the possible exception of Hayn & Gottendorf's Bibliotheca Germandrum Erotica et Curiosa (1912-14, and 1929) - leave it to Germans to so obsessively organize that you cannot easily find a damned thing - he never met a reference book he didn't like. Books on books are his bread and butter and bibliographies are blueberries 'n cream. You name it, he's probably used it at one time or another. And because he is a long-term Professional Rare Book Guy he is experienced, and has at his command resources unavailable to the average Joe or Jane Bookcollecting-Jones. From incunabula and 16th century tomes through modern lit. and 1950s paperbacks, the Rare Book Guy has walked the mean streets of Booktown. Feeling expansively, perhaps idiotically, insouciant, the Rare Book Guy invites questions about old and rare books from readers of Booktryst. If he doesn't know the answer, he knows someone who does. But the Rare Book Guy is not a sap. The Rare Book Guy is possessed of a deep well of patience for the sincere seeking rare book wisdom and would like to help. Yet while there are no stupid questions, silly questions will not be tolerated, i.e. "What's the name of that book with the red cover by that writer, y'know?" Basic courtesies must be observed, please. Because the Rare Book Guy is an Ethical Trade Professional, he cannot possibly provide appraisals for your books. Don't bother asking. One must physically examine books to be able to fairly and accurately judge their value; images don't cut it. "Can you give me a ballpark figure?" No. "Can you give me a range?" Refer to last answer. If you seek an estimate of market value, go to ViaLibri. But the Rare Book Guy will pass along this old and rare book trade verity: If you have an old book and it has a penciled price of 5¢ - $5 on an endpaper it is worth exactly that. The bookseller was no dummy and you do not, alas, possess a latent bonanza in binding. Yet the possibility, however dim, exists. If you've exhausted your own efforts to find the answer to an old and rare book-related question the Rare Book Guy is at your service. Whether a novice, casual, or serious and seasoned book collector, contact him by accessing Stephen J. Gertz's profile. Via telepathy, Gertz will channel the Rare Book Guy, who will do his best to privately reply in a timely manner. If your question is particularly intriguing, fascinating, delightful or amusing, the Rare Book Guy may be inspired to publish it with an answer that you can depend upon. And if the Rare Book Guy can work in a wisecrack or two, his day is made. Hope yours will be, too. Would you like your full name cited, or just initials and locale? If the Rare Book Guy is swamped with inquiries, he should be so lucky. In the event, he will deal with it. Somehow. Maybe. Who knows? 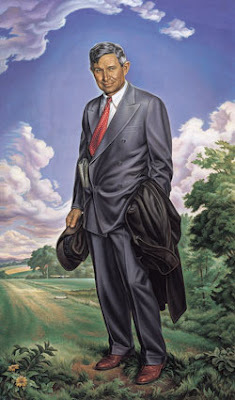 The image of Will Rogers was painted by Charles Banks Wilson, and is courtesy of Art of the Oklahoma State Capitol.